Maiev and Otak’s 2010 Christmas Cards! Holy, this blog is alive! Inside is… personalized! You’ll have to get yours to find out :) I wrote it in red! Don’t take it wrong! I did it purely for festivities! Also, red is a lucky color! Maybe I’d win the Mog Bonanza for writing cards! 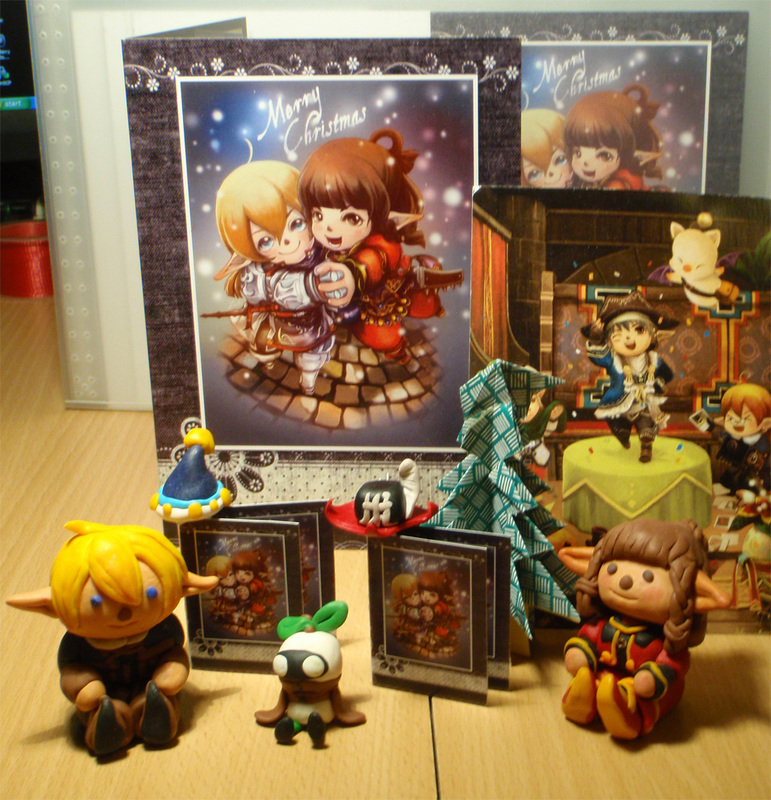 Infront of the cards, is Otak’s 2010 Christmas present for Mai :D All those little dolls :D She knew I didn’t buy those little Shantotto FFXI taru set, so she made me Otak and Mai :D! <3 Anyway! The cards are already on its way to various places around the globe. Some went to JP, some went to Europe, but most of them are just going to United States =) of course, one is heading to Hong Kong (I wonder who '.')! Just want to wish everyone a Merry Christmas =) & and Happy New Year! I'd be doing some traveling so by the time most of you get your card, I won't actually be here to see your reaction, but you can always leave a comment that I would be able to check on random computer terminals =) I'd love to read all those comments ;D! One last thing! Sorry if I missed you :< I went through like 2k comments on my blog to ensure I didn’t miss anyone ‘~” or I try :O! There’s always another chance! I love to do cards (though it takes a hella a lot of time!) so don’t you worry! I got the bestest card ever today <3 Thankyou, it's fantastic, I hope you have a super christmas and fantastic new year! Jeff! Dude!! That Xmas card is amazing!! My wife is insisting to meet you.. Haha :D really hope you make it back to FLA so I can un failface myself and see you. Seriously thanks man, best card I’ve ever got – it’s going in a frame. Hope all is well, stay in touch!! I was absolutely blown away….god I wanna get one every holiday now @_@ Thank you so much Maiev, even if I don’t do Xmas, I do however celebrate the Starlight Festival! I will follow in Jayashaya’s steps and frame it as well, it deserves more, but its the best I can do. p.s. wheres my cactuar plushie?! Eeee :D :D Got mine too! Absolutely beautiful! Thank you very much! Thank you for the keychain! I had no confusion into which one of the 3 SE one-time password for the whole last year! What’s with this double time giant taru face popping up at me! Thanks so much for the unexpected but welcome surprises! I love the little card in the awesome small card and the big card that’s supposed to make me make lots of bigger cards card?! Haha thanks so much, hope you guys are doing well and happy holidays. I’ll so get a locker at Daiso just to get treats rofl! Glad you like it :) Yea, the little cards wasn’t really part of my plan, but it kinda came in out of no where! Besides, some people I can fit them all on small paper! I just got the card today! :3 Thank you SO much! Its really sweet and I’m really happy things are ok between us now. I kinda knew you woulda taken it the way you mentioned in the card, and I was really scared to talk to you for a long time. lol so no need to apologize. I still luv Mai and will one day record it for all the world to hear, lol. Christmas is a time to bring Joy :) no exception to the Petilo lala! lulz. Though… I took a gamble on your address lulz! I wasn’t sure but didn’t want to give it away by askin haha! I’ll wait to hear that section and put it as the Cally’s incoming email tone rofl. Thank you so much. I got your card yesterday! It was so sweet :) I didn’t get bored looking at you two XD all the artwork is so cute. Plus now I can add it too my wall of art :D I was surprised to see that little coloring I did of Rini’s lines, it really made my day. It was a great Christmas extra. [CorinthCat]@Maiev my card came and it is AMAZING! Everyone in my family loved the pictures <3 Thank you! hihi!Maiev! i finally got your christmas card! very thank you!and happy new year! OMG I about spazzed when Rini told me that she had mail for me. I couldn’t think of who it might be. It drove me nuts all day till I drove over to her house to get it. Thank you so much! Its beautiful! You two did an amazing job. One of the most thoughtful cards i’ve ever gotten. Thankyou again and I hope your Christmas was great! :D lulz I can’t even imagine your expression XD (cuz im pretty sure you would never knew its from us)! BUT we love your cosplay and would come hunt you down someday for some FFXI to RL awesome-ness XD! thank you so much for the christmas card! it’s so adorable! i put it up the wall lol. Hope you had a good holiday ? ps. i love ist’s stories, they’re so awesome! I've got mine too!! Thank you thank you!!! It's amazing how you customized it so well! Thanks also for the cd.. omg a cd with my own art printed on it.. This is so freaking cool! That really shows you put care to details and your appretiation for art! Also I reconogized all the pieces inside, aww! thanks a lot for this! keep doodling! i’d be watching joo! AHH MAHJEEV THANK U FOR THE CARD!!! it was a really nice suprise and your cards are always full out haha :]! Keep drawing! Otak (lurazeda) and I will be WATCHING! lulz! THANK YOU SO MUCH! <3 I completely forgot about this card when I got it in the mail the other day. I was pleasantly surprised.! It was incredibly sweet of you to handwrite a personal message like that. I am really glad you like my artwork too! And my printed picture..
Was an amazing touch! Words cannot describe how grateful I am! ^^ This was the best Christmas gift that I received. It was a beautiful card. So thank you sooo much! We will definitely keep in touch and continue to do fun FFXIV/FFXI related art! All the best! Oh jeez, I thought I’d sent a note earlier but I guess I didn’t. Thank you guys SO MUCH for the card! It is so lovely, and I loved all the cute little drawings inside and the message! I’ll definitely be working harder, I owe you both. That was incredibly sweet. Hope you two enjoyed the holidays! I just got the card and its awesome! Yes it’s March! No you may not make fun of me! OMG!!! I still haven’t gotten one =o, but they look SOOOO cute can’t wait! You’re like, the bestestestestest artist ever!! Got it thanks Mai, Looks like you had an amazing trip to NZ! BTW I have baby boy #3 otw, we’re due in March :) Cheers!